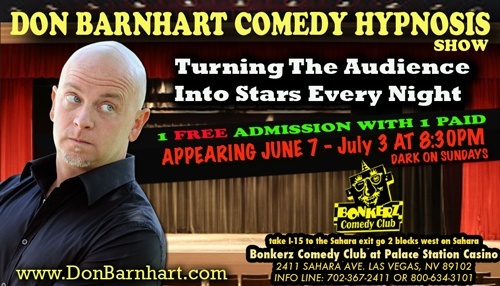 Don Barnhart, actor, hypnotist, and comedian, is bringing his act to Las Vegas. One of the very few hypnotism acts that is family-friendly, Barnhart takes the positive aspects of hypnotic trances for a spin, convinicing his volunteers to be superstars and fitness models. In an industry dominated by ebarrassing and shocking antics, the comedy brought out of our shared hopes and dreams is refreshing and honest. Don's twenty years of comedy club experience are evident, as well as his Second City improv skills and his self-improvement hypnotic abilities. Everything comes together in a show that puts the audience on center stage, inhibitions gone, ready to perform like they never have before. Skeptics encouraged to attend.